Hora, the capital of Naxos, is a beautiful Cycladic town, offering all the facilities and conveniences of a modern city. There are banks, a Health Centre, a Post Office and a very good market place where all the local produce is available: folk art, clothes, jewelers and anything else that comes to mind. It is built approximately in the centre of the western shoreline of the island, around the hill on which the Venetian castle stands, on same spot as the ancient town of Naxos. There are plenty monuments in Hora that bare witness to the island’s long history such as Portara, the archaeological area of Grota and the Venetian Castle. The Archaeological Museum of Naxos is also located in Hora. The town today has expanded mostly towards the south, around the beach of Agios Georgios, which is the most popular. This is a sandy beach, with shallow waters, sheltered from the winds and perfect for small children. There is a sports centre with modern equipment for all kinds of water sports. 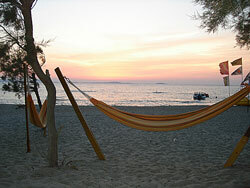 Many people, however, prefer the beach at Vidji on Hora’s northern side, close to the harbor and below the Portara. The distances in Hora can be covered on foot. There are two large council parking areas, one on the edge of the road leading to the beach and one in Grota. The cars are allowed on the outer ring road which starts at the harbor. The road leading to the beach is closed off to cars in the afternoon and at night. There is a regular bus service running between Hora, the villages and the various beaches.